One of the joys of senior photography is working with the guys. Typically, they aren't really into the whole"senior picture" thing. Fortunately, their mom is, so they have a motivating reason for making sure they come out great. Despite their lack of interest in the session at times, it is rare that they produce pictures that don't come out great. Most of my male seniors bring a little attitude with them, a sense of underlying confidence that they try and cover up. Normally, it doesn't work out for them and that special something exposes itself. 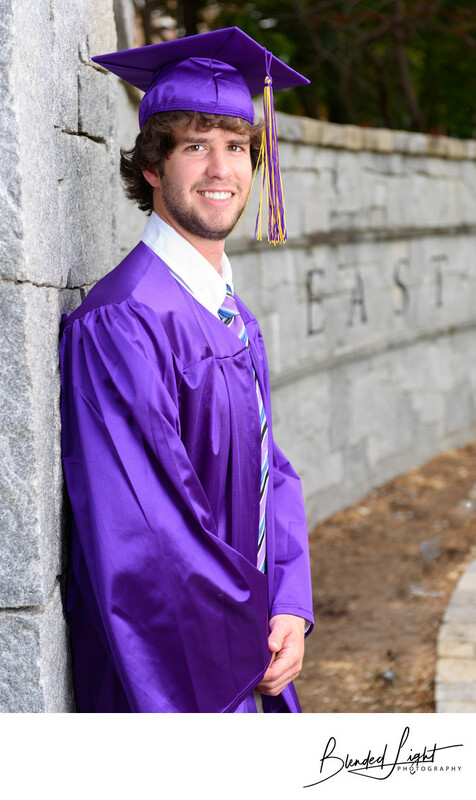 Here's a basic senior portrait of a young man completing his undergraduate degree at East Carolina University. I almost always start the ECU sessions at the stone wall right near the downtown area as it provides a sense of where we are and it is great place to get the feel of the session. The wall was erected several years ago as a welcoming and identifying sign for the University and has become a required location for graduate images. Leaning against the wall, this ECU senior made a great image by being himself, something that is sometimes easier said than done. A little off camera flash and we had a hit image for mom! 1/125; f/4.0; ISO 50; 70.0 mm.